Ulocladium is a dematiaceous filamentous fungus that inhabits the soil and decaying herbaceous plants. It is widely distributed in nature and may be isolated from paper, textiles, and wood as well. Ulocladium is commonly considered as a contaminant. It may very rarely cause human disease. The genus Ulocladium has two active species; Ulocladium chartarum and Ulocladium botrytis. The morphological features of the conidiophores and the conidia aid in differentiation and identification of the two species. See the list of active and obsolete names for Ulocladium spp. Ulocladium spp. may cause phaeohyphomycosis and particularly subcutaneous infections. Colonies of Ulocladium grow moderately rapidly. At 25°C and on potato dextrose agar, the colonies are wooly to cottony. From the front and the reverse, the color is olive brown to black [531, 1295, 2144, 2202]. Septate brown hyphae, brown conidiophores, and conidia are visualized. Conidiophores are simple or branched, smooth, strongly geniculate (bent at the points where the conidia are produced, leading to a zigzag appearence; “bent knee”) and bear the conidia. 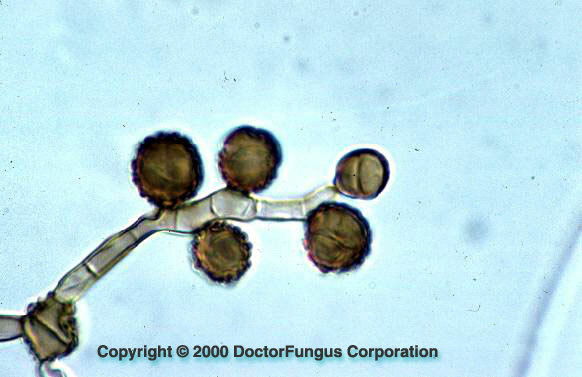 Conidia (13-30 x 6-19 µm) are brown to black, round to oval in shape, smooth or rough and verrucous. They are usually egg-shaped and have a narrower base compared to its apex. These conidia are typically muriform and have transverse and longitudinal septations. They are solitary (Ulocladium botrytis) or may form short chains (Ulocladium chartarum). When chains are produced, a tubular, short outgrowth is formed on the conidia at the point of secondary conidium formation [531, 2144, 2202]. Pale pigmented ellipsoidal structures may be observed. See also our histopathology page. Ulocladium differs from Alternaria by its strongly geniculate conidiophores, and the absence of beak-like tapered apex of conidia. It differs from Bipolaris, Curvularia, and Drechslera by producing muriform conidia. Ulocladium is differentiated from Stemphylium by having geniculate, sympodial conidiophores. Very limited data are available. Amphotericin B, ketoconazole, and itraconazole yield lower MICs for Ulocladium botrytis compared to Ulocladium chartarum. Flucytosine and fluconazole MICs are very high for both species .